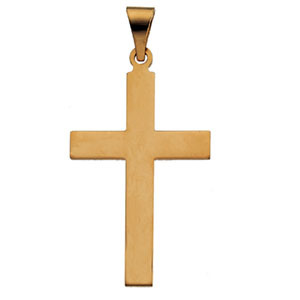 Classic smooth cross is made of polished 14kt yellow gold. Smooth clean finish. Dimensions: 28x18mm. This item is larger than a quarter. Weight: 1.39 grams. Please note: weight is approximate, actual weight may vary. Chain not included. Bail size: 3.0 x 4.0mm. We recommend a chain no thicker then 2.75mm. He wanted a charm to wear each day. Loves the cross pendant. This was for an anniversary present for my husband. The item arrived in a timely manner. It was exactly the size I needed, and though the picture didn't show the finish as polished, I went by the description, and it was. Next I'll need a chain, and the gift will be complete! I may get myself one down the road. Thanks.